Travelling with a disabled person, or someone who needs a high level of care, can seem like a daunting prospect. 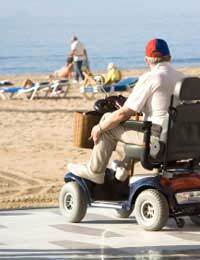 Understandably many carers avoid taking holidays because they are worried about the difficulties they will face when travelling. This needn’t be the case, providing you are well prepared and plan ahead. Here are some essential travel tips for carers. When packing for your holiday, make sure that you prepare for any eventuality, including the loss of your luggage. If your travel companion requires a set of medicines, you should keep a complete set of each medicine in every stowed piece of luggage, just in case any bags unexpectedly go missing. Try to carry some extra medicines, just in case your flights experience any delays or fall victim to air traffic control strikes or bad weather. It is advisable to carry a doctor’s note with you if you are entering a country that you know has strict drug controls. Be prepared to explain to the Customs official why you are carrying the medicines you have with you. Where you can, try to keep the level of medical equipment you take with you to a minimum and take only what you consider to be essential. If you need to carry specialist equipment, such as ventilators, make sure that you obtain phone numbers of foreign disability organisations that will be able to provide replacements if these are damaged in transit or in need of repair. Your travel company or the Foreign Office should be able to help you find these. If you are packing electrical equipment make sure that you have the correct travel adapters and/or a healthy supply of the correct batteries. Most airports and airlines now have excellent facilities for disabled persons and most UK airport terminals are equipped with ramps, lowered kerbs, accessible toilets for wheelchair and even low-level telephones and cashpoints. You may find that the airports in other countries are less accommodating, so you should contact your airline in advance and talk to them if you will have any specific needs once you reach your holiday destination. Airline food is uninspiring at the best of times, but if your travel partner has specific dietary requirements, you should contact the airline in advance to let them know. Do not rely on your tour operator contacting the airline directly to inform them of your needs. Similarly, if you or your companion require extra legroom, don’t be too polite to ask, you might even earn yourself an upgrade! Most ferry ports are less modernised than airports, so again you should check with the port and the ferry company if you think you might require assistance. Some older vessels may have little wheelchair access and a stormy crossing may make it increasingly difficult to negotiate berths, heavy doorways or lifts. Make sure that you do plenty of research regarding the ferry operator before you make a booking and ask lots of questions about the company’s attitude towards passengers with special needs. Despite several years of improvements to trains, accessibility on the rail network remains something of a concern for passengers with mobility issues. Before making any arrangements to travel by rail with a disabled person in a wheelchair, you should ensure that the stations you need to use – including anywhere you will need to change trains – have suitable access facilities and that assistance is available if required. The good news is that disabled people can obtain a Disabled Persons Railcard which will offer them discounts on single and return journeys. The Eurostar offers a Special Needs Passenger ticket for anyone in a wheelchair and the person accompanying them, and for any person accompanying a passenger who is registered blind. Registered blind and partially sighted people can get the same discounts, but only if they travel with a companion.